C-Span came to record my book talk at Barnes and Noble last month, so I knew it was coming. But it was still exciting to flip the remote to C-Span in my parents' living room and watch them jump around at the sight of their kid on the TV set. The talk itself was good, but not as good as that feeling. As those of you who have purchased the book now, I dedicated it to my parents, who certainly have suffered the most from my love of questions. I don't think you can access the C-Span clip, but you can hear my latest interviews on The Peter B. Collins Show and Blog Business World with Wayne Hurlbert. Robert Ellman of the Intrepid Liberal Journal grills me in this podcast interview currently cross-posted throughout the political blogosphere. From Rob's intro: "The one life lesson Schlesinger has learned above all others in her career and promotes passionately her book is that questions equals power. It is Schlesinger's contention that our culture promotes instant answers at the expense of inquiring. 4) Convey a sense of urgency among citizens to develop effective "habits of the mind" and not be easily seduced by instant easy sound bite answers to complex challenges such as global warming. Death of Why, is a well researched and scrupulously sourced eleven chapters and 215 pages of text. Where Schlesinger's book is especially provocative is when she takes bloggers like me to task for engaging in robotic group-think and avoiding engagement with people possessing different viewpoints." Thanks, Rob, for the great interview. Just a simple one-word sentence, yet it conveys probably the most anarchic, the most radical, the most provocative and the most democratizing thought in the world. The ability to question....no, the right and responsibility to question is the very cornerstone of our democracy. The Founding Fathers set forth programs and laid the groundwork to check the workings of our govenment by requiring it to answer to the people from which it was composed. And yet, somewhere in the last forty years ago or so, we've lost our way. We, collectively as a nation, have decided that we needed to focus on the answers rather than ask the questions. We opt to live among others who share our values, rather than stand to have them questioned by other points of views. We select our media sources from those with which we share an ideological point of view, so our preconceived biases never are challenged. We pour money into the self-help industry, looking for someone to give us the answers that we seek, rather than do the hard work of finding our own path or questioning if we need measure our success in the same way. We gravitate towards politicians who appear to us to have the answers, even though the issues that face us cannot be "solved" by simple answers. Our lack of appreciation of the power and value of questions leave us mostly disengaged from the democracy of which we're a part. Fewer and fewer people have any notion of how government works and that lack of engagement enables life-changing legislation to get passed with little public discussion. Where did we lose our way? When did questioning stop being an act of democracy and become unpatriotic? How does this bode for our collective future as another generation is raised with fewer skills to look deeper at issues and analyze and synthesize information to consider solutions? Drum Major Institute's Executive Director Andrea Batista Schlessinger looks at this issue in her new book The Death of Why and she joins us here today to discuss it. It is Andrea's position that so much of the policy debate is won in the framing. How are issues discussed? Through what lens do we approach debates about government and its role in our lives? Are we creating the capacity/will/desire in our young people to question? Are the tools that we give children to learn actually limiting their ability to really think? These are questions that go right to the heart of where we find ourselves today and some fairly frightening prospects for our future if we don't reintroduce the value of questioning to the next generation. 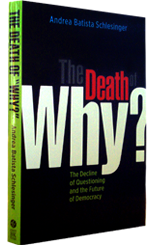 Andrea Batista Schlesinger, a featured speaker at Facing Race 2008 and an ARC boardmember, has written her first book, The Death of Why: The Decline of Questioning and the Future of Democracy. The ability to inquire deeply is the lifeblood of a great democracy, Andrea argues, and Americans have lost much of their questioning muscle in the age of the internet and standardized testing. In chapters ranging from disappearing civics education to the myth of financial literacy ("No Piggybank Left Behind! "), Andrea teaches us the value of struggling with what we don't know, so that we can think and act in ways that transport us outside of our conventional bubbles of so-called wisdom. The book is full of stories, both cautionary and inspiring. Since Andrea blames me for coming up with the miserable notion that she should write a book, good sales among ARC friends will help heal our relationship.